One of the best ways to teach, is to make learning easy and fun! Children are developing at a rapid pace these days. They play, learn, experiment and are also beginning to get a sense of their own identity from a very young age. Children learn through all of their senses and listening is one of the main ways in which children learn. Because it’s fun, children often become very absorbed in what they are doing. In turn, this helps them develop the ability to concentrate. This is one of the reasons why we love creating our Music Audio Stories. They combine the key aspects of musical learning with education. Apart from enjoying our stories together with your child, you'll find many benefits listening to our audiobooks. They enhance mental well-being, build confidence and develop imagination. They teach your child the importance of friendship, cooperation, tolerance and team effort with everyone no matter how different they are. They inspire movement, problem-solving, build social skills and promote concentration. Your child will learn about animals and insects, colours, numbers, nature, and magic! Each story has excellent lessons which are taught in such a fun and simple way, children don’t even realize they are learning a lesson! Music ignites all areas of child development and skills for school readiness: intellectual, social and emotional, language, and overall literacy. Exposing children to music and storytelling during early development helps them learn the sounds and meanings of words. 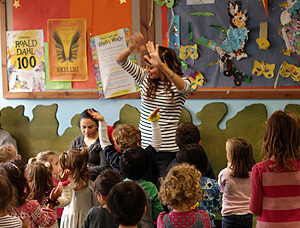 Dancing to music helps children build motor skills while allowing them to practice self-expression. Music also helps to strengthen memory skills. So encourage playful learning with your children with one of our Music Audio Stories! Visit our Shop for a variety of stories and other things made with love!